The Food and Drug Administration on Tuesday released draft guidance to help chain restaurants and groceries comply with an Obamacare regulation that requires calorie labeling on menus. FDA commissioner Scott Gottlieb said the guidance is "practical, efficient and sustainable," in an attempt to alleviate concerns from pizza chains and grocers that the government was moving forward with an onerous Obama administration rule that carries criminal penalties for "misbranding" food. Questions about the rule remain, since the guidance only contains "nonbinding recommendations." In addition, chain restaurants could be confused by language in the guidance related to what draft beers must be labeled. The FDA says, "It depends." The regulation, which applies to chains of 20 or more stores, is set to take effect in May 2018. The Trump administration delayed the compliance date earlier this year to take into account concerns of companies and food associations that must comply. "I'm fully committed to implementing these provisions on the timetable we've already announced," Gottlieb said. "But I'm equally committed to making sure we implement these provisions in a way that is practical, efficient, and sustainable." "FDA is releasing a draft guidance in direct response to the comments we got on our menu labeling regulation," he said. "We've heard the concerns, took them to heart, and are responding with practical solutions to make it easier for industry to meet their obligations in these important public health endeavors." 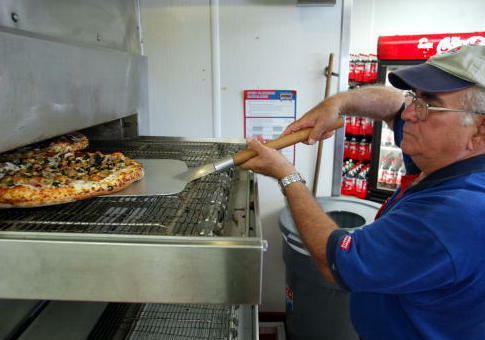 Pizza chains represented by the American Pizza Community—including Domino's, Papa John's, and Little Caesars—raised the issue that pizza can contain up to a billion topping combinations, making the rule unworkable unless they can comply online. Domino's has said the vast majority of their orders are already placed online, where customers can use a calorie tracker for any pizza they order. The new FDA guidance does not allow pizza chains to comply online but attempts to provide more flexibility with allowing companies to use calorie ranges. "[E]ven though you declare calories on your online menu, if you choose to use a menu board in your covered establishment you must provide calorie declarations for standard menu items listed on your menu board," the FDA guidance states. The FDA says pizza chains can implement a system using an "in-store tablet or electronic kiosk" to comply with the regulation, instead of posting calories on the main menu board for every topping offered. "Pizza delivery chain owners told us they were struggling to develop menu boards reflecting the thousands of topping combinations people might want on their pizza, so we provided several new examples for how to do this to help them comply with the law's plain language," Gottlieb said. The examples include large menus that mostly consist of calorie labeling, including the listing of "fresh onions" as having between 0 and 5 calories. The FDA guidance also addresses questions about the definition of a menu. The Obama administration's definition spanned 171 words and would have included advertisements and coupons. The new guidance said that restaurants and convenience stores would "generally" not have to put calorie information on coupons or posters. 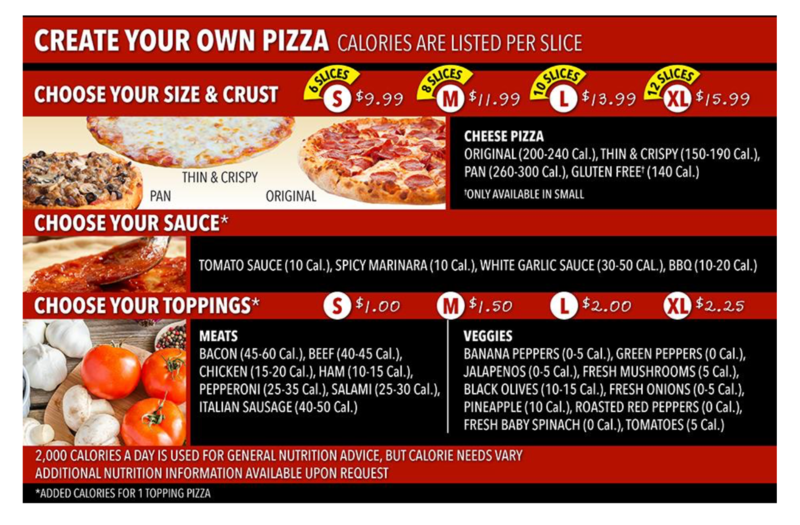 "Marketing material (e.g., pizza coupons, posters in store windows, signs on gas pumps, or paper inserts) generally would not be considered a menu or menu board and would not require calorie declarations," the guidance states. The FDA said most posters or promotional materials would be considered "secondary writing" and not a primary menu and therefore would not need to list calorie counts. The FDA has withdrawn two questions from the Obama administration's April 2016 guidance for the regulation that related to listing calorie counts on advertisements. The guidance gets slightly more complicated when considering what beers will be required by the government to have listed calorie counts. "I am a covered establishment. I list various beers on my menu or menu board, some of which I rotate regularly to feature local or seasonal beer throughout the year (e.g., pumpkin beer in the fall)," reads a hypothetical question included in the guidance. "Am I required to declare calories for the beers listed on my menu or menu board that I offer at my establishment?" "It depends," the FDA states. The government explains that beers, including beers on tap, which are "listed on your menu or menu board and meet the definition of a standard menu item" would require calorie information. However, beers on tap that are not listed on the main menu would not need calories, since they are "considered foods on display." Chain restaurants would also not have to list calories of seasonal beers, such as a pumpkin beer, as long as they do not serve the beer for longer than 60 days during one calendar year. For supermarkets, the FDA now says not every single item at a hot food or salad bar would need to be marked, as long as all the items are listed on a single sign that is "visible while consumers are making their selection." Groceries could also mark calories for self-service foods on individual signs using "gel clings on the sneeze guard." The FDA said it is seeking to "work cooperatively with covered establishments to come into compliance." The government said it does not "intend to penalize or recommend the use of criminal penalties for minor violations." As written, violations of the regulation can include criminal penalties of up to a $1,000 fine, one year in prison, or both. Minor violations, according to the FDA, are inadvertently missing calories for one item on a buffet, "minor discrepancies in the type size/color contrast of calorie declarations, provided that they are readable," and not rounding calories. The government said it does not intend to penalize food manufactures for "adding extra slices of pepperoni on a pizza or adding an extra dollop of ketchup on a hamburger when not typically added." Theresa Eisenman, an FDA spokesperson, told the Washington Free Beacon that the FDA would work with state and local governments, which will ultimately be responsible for enforcing the regulation. "FDA guidance documents are nonbinding," she said. "Guidance documents represent FDA's current thinking on a topic. You can use an alternative approach if the approach satisfies the requirements of the applicable statutes and regulations." "We recognize the importance of consistent compliance and enforcement of the menu labeling regulation and are in the process of completing our compliance strategy now," Eisenman added. "We will work closely with state and local governments to help train all those involved in enforcing the rule, and we will emphasize the flexibility cited in the FDA guidance. The draft guidance, once finalized, will be used to help train all those involved in enforcing the rule." This entry was posted in Issues and tagged FDA, Government Waste, Obamacare. Bookmark the permalink.